Sit back, keep cool, and enjoy an elegant evening of terrace riverside dining along Kyoto’s rivers. Kamogawa yuka noryo (a rough translation of the phrase would be “enjoying the cool of the evening while sitting on a terrace by the Kamo River”) is the name of this dining tradition, which like so many of storied Kyoto’s many long-standing cultural institutions, has been around for quite a while. More than 400 years, in fact. Prior to the Edo Period, the riverside had been a popular place for performers and vendors, who would set up folding benches for their clients. Eventually Kyoto’s upper classes, as well as a growing class of merchants, decided that this bohemian atmosphere would make the ideal backdrop for the banquets they would hold during the spring and summer. The riverside came to be even more popular in the centuries to come, and being able to find relief from the hot summers while dining, drinking, and making merry became one of the city’s notable pleasures. 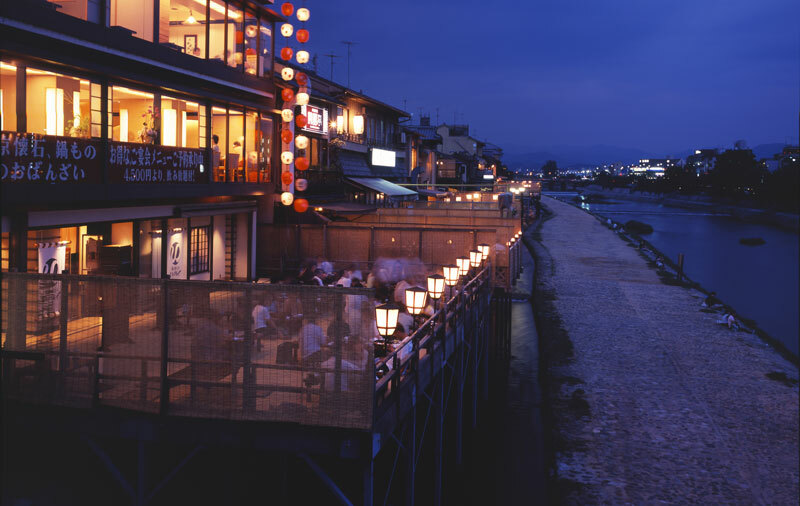 Located in the border area between Kyoto’s bustling downtown and the neighborhoods north of Gion, the terraces are put up from May until September, and connect dozens of restaurants along the shores of the Kamo River. 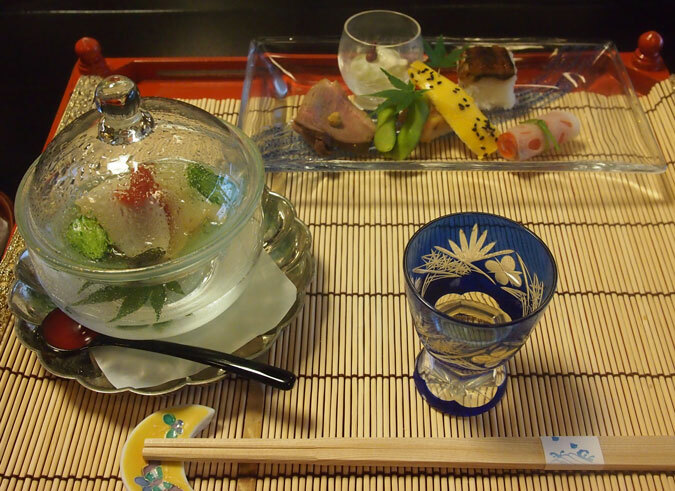 We dropped in at one of neighborhood’s longest-standing restaurants, Ikumatsu, to try the city’s most celebrated cuisine: kaiseki ryori, an elaborate series of dishes made with seasonal ingredients. As we listened to the sound of the river and the evening’s passers-by, we were presented with plate after plate of unique dishes: salmon with lotus roots, parched abalone, grilled sweetfish, conger eel, tofu with sea urchin and varieties of Kyoto’s local vegetables, served with delicately sweet plum liqueur to start and a variety of sake to accompany the spectrum of flavors. Of course, if you’re in the mood for a different style of food, there are a wide variety of restaurants that can be found along the Kamo River. If you’re in the mood for grilled meat, yakiniku is a popular option, or you can opt for more casual izakaya fare. In recent years, more cosmopolitan options have become available, and you can now find Chinese, Thai, Italian, and French restaurants with riverside terraces. And if you don’t want a meal, you can just drop in on one of several bars and cafés that offer a yuka noryo experience. Even though there is a wider variety of food served now than there would have been in centuries past, the community of restaurants is still tightly knit, and before new establishments can open, they have to be vetted by an association of the owners to make sure that they will be a worthy addition to the riverside environment. Just having a famous name is not enough, as Akihiko Kubo, the fifth-generation manager of Ikumatsu, and the president of the Association of Kamogawa Yuka Noryo, explained. For several years, Starbucks was trying to open a location along the riverside, but was rebuffed for a few years before the Association gave it permission to open: they wanted to make sure that the coffee megachain would be appropriate new member of the neighborhood. 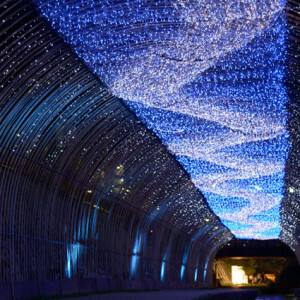 In August, during Kyoto’s celebration of the Tanabata holiday, you can dine under the stars, and take in the illumination on the walkway below, or gaze on the light projection that is shown on the opposite side of the river. 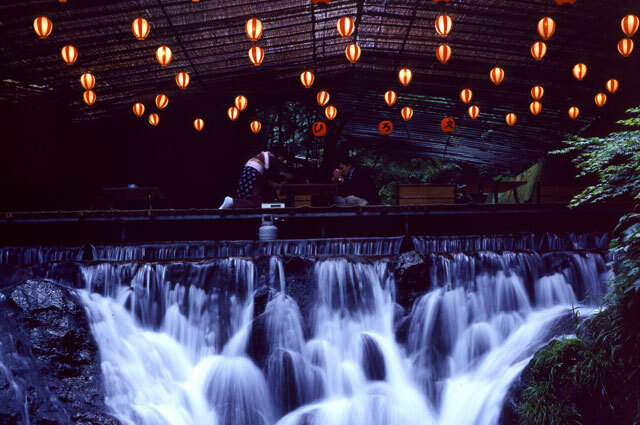 While the Kamogawa terraces are the most well known and have the longest history, the area also offers several other locations where you experience this outdoor dining. Kibune (pictured above) and Takao, to the north of Kyoto, both have restaurants with their own version of the yuka noryo experience. Until the end of September, take a break from the season’s heat and make a riverside meal part of your summer experience in Kyoto.